In the winter of 1916, C.S. Lewis went to sit for his scholarship examination at Oxford. Lewis dreamed of becoming of scholar, but the reality was World War I was at hand, and many of Lewis’s acquaintances from his school days were now training to become soldiers. Despite the increasingly ominous political climate in England, Lewis continued to pursue his academic aspirations. Having trained with his tutor Mr. Kirkpatrick, Lewis initially approached Oxford with great confidence. The next morning after his arrival, Lewis and other young men braved the snow to take exams in the Hall of Oriel. The boys all wrote “in greatcoats and mufflers and wearing at least our left-hand gloves” (SJB 185). Lewis’s confidence soon wilted and he “had the impression that I was doing badly”. He later arrived home and told his father that he “almost certainly failed”. However, Lewis had miscalculated, for just a few weeks later, he found — to his great surprise and joy– that he had been elected to University. In the summer of 1917, Lewis entered the University Officer’s Training Corps “as my most promising route into the army”. Although he failed the mathematical portion of Responsions, he states that a “benevolent decree exempted ex-servicemen from taking it”. As odd as it seems, Lewis must credit his acceptance into Oxford (and his subsequent 29-year career afterward as a tutor and don) on this “benevolent decree”. Due to his repeated failures in mathematics, Lewis could not have entered Oxford otherwise. Lewis had only spent a few weeks at Oxford when his “papers came through” and he was enlisted into the army. He was drafted into a Cadet Battalion at Keble College. While at Keble, Lewis roomed with another young Irishman named Edward Francis Courtney “Paddy” Moore. Paddy’s mother, Janie Moore, was a 45-year-old “divorcee” (divorce was only granted in rare circumstances) who remained happily separated from her husband Courtenay Edward Moore, a civil engineer in Ireland she later referred to as “The Beast”. Although she and her daughter Maureen lived in Bristol, they moved to Oxford after Paddy was assigned to Keble. Not long after they had kindled a friendship, Paddy invited Lewis home to meet his mother. Thus began a strange and controversial relationship. Walter Hooper writes in They Stand Together that, “Lewis seems to have taken a great liking to Mrs. Moore from the first and even, as this and subsequent letters show, to have been youthfully infatuated with her” (199). In a letter to his father which described his visit, Lewis states, “Moore, my room mate, comes from Clifton and is a very decent sort of man: his mother, an Irish lady, is staying up here and I have met her once or twice”. Then, the following week, Lewis exclaims to his father: “I like her immensely and thoroughly enjoyed myself” (Letters of C.S. Lewis 64). Mrs. Moore, like Lewis’s mother Flora, was the daughter of an Irish clergyman. To the young Lewis, she seemed a suitable replacement, perhaps an echo of the mother he had lost years earlier. Alas, Lewis became almost a second son to Mrs. Moore, electing to spend the majority of his September 1917 furlough (three of the four weeks) with the Moores. During that time, Lewis came down with a feverish cold and Mrs. Moore “nursed him back to health” (All My Road Before Me 2). Lewis spent the final week with his father in Belfast before being gazetted into the 3rd Somerset Light Infantry. It is believed that Lewis admitted to his boyhood friend and lifelong correspondent Arthur Greeves the extent of his affection for Mrs. Moore during this final week of furlough. However, in a letter dated 29 October 1917, Lewis regrettably writes: “Since coming back & meeting a certain person I have begun to realize that it was not at all the right thing for me to tell you so much as I did. I must therefore try to undo my actions as far as possible by asking you to try & forget my various statements & not refer to the subject. Of course I have perfect trust in you, mon vieux, but still I have no business to go discussing those sort of things with you. So in the future that topic must be taboo between us” (They Stand Together 200). 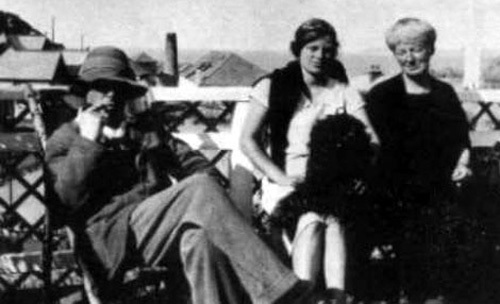 Lewis still mentioned Mrs. Moore in his letters, claiming to Arthur in December 1917 that he and Mrs. Moore “are the two people who matter most to me in the world” (They Stand Together 204). Just before they were assigned, Maureen overheard Paddy and Lewis make an oral pact; if either Paddy or Lewis dies in battle, the other would care for his surviving parent. This was a promise that both men enthusiastically made, but assumed would be unnecessary. In November, Lewis’s regiment was headed to the front lines of the war after a 48-hour leave. Because the trips to and from Ireland would consume the entire 48 hours, Lewis went to Mrs. Moore’s in Bristol and sent an urgent telegram to his father: “Have arrived Bristol on 48 hours leave. Report Southampton Saturday. Can you come Bristol. If so meet at Station. Reply Mrs. Moore’s address…Jack”. Unfortunately, Albert could not understand the telegram. By the time Lewis sent a second telegram to his father expressing clarification, the time was nearly expired. Albert did not come to Bristol and the youngest Lewis was sent to France to fight on the front lines. As time progressed, Lewis kept close contact with Mrs. Moore, and he was well-acquainted with her worry and distress when Paddy was reported missing in the spring of 1918. In a letter to his father, Lewis writes, “My friend Mrs. Moore is in great trouble – Paddy has been missing for over a month and is almost certainly dead. Of all my own particular set at Keble he has been the first to go, and it is pathetic to remember that he at least was always certain that he would come through” (Letters of C.S. Lewis 79). I know I have often been far from what I should in my relations to you, and have undervalued an affection and a generosity which …an experience of ‘other people’s parents’ has shown me in a new light. But, please God, I shall be better in the future. Come and see me. I am homesick, that is the long and the short of it…this week Mrs. Moore has been up on a visit to her sister who works at the War Office, and we have seen a good deal of each other. I think it some comfort to her to be with someone who was a friend of Paddy’s and is a link with the Oxford days: she has certainly been a very, very good friend to me (84). In June, Lewis was transferred to a hospital near Bristol, to enjoy Mrs. Moore’s companionship as he convalesced. Months passed, and Lewis’s father was still notably absent. That fall, it was confirmed that Paddy was indeed deceased. Mrs. Moore had lost her son, Lewis had ostensibly lost his father. What was there to do but to cling to each other? When their mother passed away, Lewis and his brother Warnie relied upon one another. Now Mrs. Moore was reaching for her “second son” to comfort her, a young man just a few days younger than her own beloved Paddy. After Paddy’s death, the bond between Lewis and Moore was strengthened and solidified. When Lewis was moved to Hampshire in October, Mrs. Moore went with him. Lewis was transferred to a hospital in Eastbourne for the final weeks of his recovery; Mrs. Moore rented an apartment near the camp. 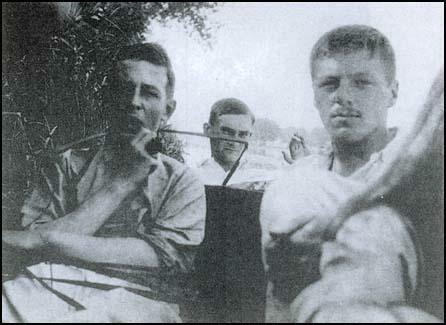 At the conclusion of the war, Lewis resumed his studies in Oxford. 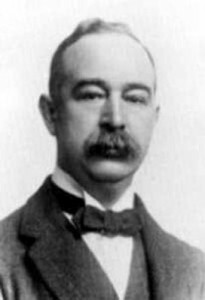 Despite his negligence during the war, Albert Lewis generously funded his son’s continuing studies as Lewis matriculated through three different programs (Lewis achieved a First in Honour Moderations, Greats, and English). Lewis now considered Mrs. Moore and Maureen his “family”. Unbeknownst to Albert, they had moved with Lewis to Oxford. Lewis was, most likely, helping Mrs. Moore meet her financial obligations. The money she received from her “ex-husband” was clearly not sufficient. Lewis mentions in a letter to Arthur Greeves that “we pay a little less than the whole for her still having a room” (emphasis added). Note Lewis’s use of the plural pronoun– “we”. After his three required terms of living at University College, Lewis was allowed to obtain other lodgings. Lewis then moved in with the Moores, but they all suffered under the continual threat of poverty. Before they collectively purchased The Kilns in 1930, the trio moved nine times. Walter Hooper illuminates that the achievements of Lewis’s “Firsts” at Oxford were obtained all while juggling domestic responsibilities in the home as well as moving his belongings to several different locations. Albert, over time, had become suspicious of Mrs. Moore. 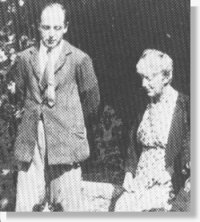 Even when Lewis was in Belfast during leaves and furloughs, Mrs. Moore wrote nearly every day in care of Lewis’s friend Arthur Greeves. Why couldn’t these letters be delivered to Little Lea? The Mrs. Moore business is certainly a mystery but I think perhaps you are making too much of it. Have you any idea of the footing on which he is with her? Is she an intellectual? It seems to me preposterous that there can be anything in it. But the whole thing irritates me by its freakishness. I confess I do not know what to do or say about Jack’s affair. It worries and depresses me greatly. All I know about the lady is that she is old enough to be his mother – that she is separated from her husband and that she is in poor circumstances. I also know that Jacks has frequently drawn cheques in her favour running up to ₤10 – for what I don’t know. If Jacks were not an impetuous, kind hearted creature who could be cajoled by any woman who has been through the mill, I should not be so uneasy. Then there is the husband whom I have been told is a scoundrel – but the absent are always to blame – some where in the background, who some of these days might try a little amiable black mailing. But outside all these considerations that may be the outcome of a suspicious, police court mind, there is a distraction from work and the folly of the daily letters. Altogether I am uncomfortable. Mrs. Moore, Maureen, and Lewis purchased The Kilns in 1930. Lewis and Moore’s relationship seemed to shift after Lewis’s conversion; He often referred to her as “Mother” in his correspondence. He continued to dote on her, the “surrogate mother” although it was well-documented that Warnie (who moved into The Kilns after retirement) didn’t prefer her company. Mrs. Moore remained at The Kilns until she developed dementia, a ravenous disease which altered Moore’s otherwise amiable personality. Lewis took on an increasing number of the household chores and nursing responsibilities as her illness progressed, while still producing an impressive amount of published works, both scholarly and imaginative. Once the dementia reached advanced stages, Mrs. Moore was transferred to a retirement facility. Lewis visited Mrs. Moore every day until her death in 1951. **Reader’s Note: Lewis often refers to Mrs. Moore as “Minto” (pet name – we are unsure if it’s origin). In All My Road Before Me, editor Walter Hooper uses “D” for the Greek letter Delta. So how do we define the relationship between Lewis and Mrs. Moore? I have had to alter my opinion of Lewis’s relationship with Mrs. Moore. In chapter eight of this book I wrote that I was uncertain about whether they were lovers. Now after conversations with Mrs. Moore’s daughter, Maureen, and a consideration of the way in which their bedrooms were arranged at The Kilns, I am quite certain that they were. The notion of sexual intimacy between the two must be regarded as likely. The sensual young atheist lives with a not unattractive woman, still in early middle age, who is not only available to him but very likely possessed of an agenda of her own: the young man is, as his father points out, fundamentally good-natured and easily manipulated, and the woman – in that society, at that time – would surely benefit from the presence of a man in the household. This combination of motive, means, and opportunity invites, though it does not demand, the conclusion that Janie King Moore and C.S. Lewis were lovers. How long did the affair last? We do not and cannot know. As mentioned earlier, Lewis considered the subject “taboo”, even with close friends. It was Lewis’s private life, and thus was his own business. However, some argue that Lewis, as spokesman for the Christian faith, must live a transparent life. Lewis writes to Bernard Acworth on 4 October, 1951: “When a man has become a popular Apologist he must watch his step. Everyone is on the lookout for things that might discredit him”. After Lewis’s conversion, did he amend his relationship with Mrs. Moore? Most biographers believe that he did. For many, it is unsettling to consider Lewis in an Oedipal relationship with a married woman. However, Lewis’s new faith baptized his heart, mind, and body. There was a holistic change; and Lewis perhaps perceived himself now as a protector and provider for his adopted “family”. He was an individual steeped in honesty and integrity (despite the earlier episodes of lying to his father which he regretted later in life). That is where the fascination and curiosity must surrender to the mystery. We don’t know the depth of his involvement with Mrs. Moore, but we do know that he had an undimishing loyalty and respect for her. If they had a sexual relationship, it is clear that it evolved from Eros to Phileo. What began with passion had settled into genuine fondness. We also know that Lewis’s inspiring works originate from a place of spiritual maturity, wisdom, and obedience – a much different place than that of a twenty-something, “priggish” aspiring scholar. Thus it is unwise to overinterpret. The nature of their intimacy, its duration, and the circumstances under which it ended are largely unknown to us. What is known is the day-to-day devotion shown by C.S. Lewis to Mrs. Moore until her death, after a long mental and physical decline, at the age of 78. Life is more richly textured – or as Lewis would put it, ‘thicker’ – than we expect it to be. None of us is either this or that; rather we and all the ‘ordinary’ people we meet and know are many things at once, full of shading and nuance. This story may have begun in self-indulgence, cynicism and sin, but it ended as an enduring exemplum of Christian charity – and of Divine Economy (All My Road Before Me 9). Next week, we will take a brief look Lewis’s female correspondents, including a nun, widows, and aspiring poets!! I tweeted this for what few Twitter followers I have. I know very little about C.S. Lewis’s life, but I found this a fascinating read. Somehow I overlooked some of your other recent posts, although I have your blog in my WordPress reader. I shall have to make some time to go back. Thanks Virgil! Please feel free to stop by anytime. I am expanding this website to also do some discussion about leadership. Hope you are enjoying the Lewis and Women series so far! But what about that quote from Lewis after Janie died that he hadn’t gone 24 hours without grief from her? Is that just referring to her later years? Someone wrote that she’s the one he’s referring to when he writes in “Screwtape” (and I think maybe “The Great Divorce,” too) about the woman with the sin of delicacy. Was Lewis, who lost his mother at 9, easy prey for a domineering woman 27 years his senior? Yes, as Mrs. Moore’s condition worsened, she was more severe on those in the house. I don’t believe Lewis held it against her, as he knew that her illness was the catalyst for such a drastic change in personality. In his diary All My Road Before Me, Lewis speaks very highly of Mrs. Moore. He finds her generous and loving. As a young man, he consulted her on various personal affairs and was essentially “adopted” by the Moores as a second son. Based upon the reading, I firmly believe that Lewis revered her as a mother figure in the absence of his biological mother. Even when she was transported to a retirement facility, Lewis visited her every day until her death. He was a “dutiful son”. As far as the portrait from The Great Divorce, there is some speculation if the bus passengers are autobiographical in nature. I have read some excellent arguments on who “such and such” might be inspired from, but then again, it is mere speculation. In the letters, Albert feared that his son would be trapped by a divorcee (what we might today term as a “cougar”) who would take advantage of him. He appears to be quite naïve of women during this time. I think Mrs. Moore’s warm and welcoming personality proved a foil to the cold, emotionally-bankrupt style of his father. After reading some of The Lewis Papers at the Wade Center this summer, I feel that Jack was a bit harsh toward his father. His father seems authentically concerned about his son. Can we blame him? The arrangement was awkward — if it were not so, Jack would not have tried so hard to conceal it from his father and the college. In the end, I think that Mrs. Moore needed a son and C.S. Lewis needed a mother. One filled a vacuum for the other and that is how this strange relationship evolved.